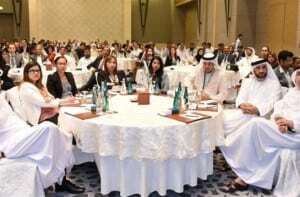 Dubai Exports, the export promotion agency of the Department of Economic Development (DED) in Dubai, organised a conference on compliance requirements and potential markets for halal products, in association with the Emirates Authority for Standardisation & Metrology (ESMA). Held at The Address Dubai Mall, the conference was organised in the context of Dubai’s march towards being the capital of Islamic economy and aimed to increase awareness among local businesses on halal requirements, encourage manufacturers to obtain halal certification and promote local halal products in markets overseas. “Export of Islamic products and services is critical to achieving the vision of our leadership to establish Dubai as the capital of Islamic economy by 2016. Dubai Exports is supporting the fast emerging Islamic economy portfolio in Dubai by encouraging local manufacturers and exporters to align their products and services to internationally accepted halal standards,” commented Engineer Saed Al Awadi, Chief Executive Officer of Dubai Exports. Al Awadi added that Dubai already has a manufacturing and exports sector well versed with overseas markets and preferences in those markets. “Dubai Exports has been working with local exporters helping them to acquire world class competencies and tap existing and emerging market opportunities. The global halal market is estimated to be worth AED 8.4 trillion (US$2.3 trillion) annually and the halal foods sector alone is worth AED 2.5 trillion. We are confident that our local firms can capture a sizeable share of this business with adequate update on market trends and halal standards,” Al Awadi added. Abdullah Al Maeeni, Director General of ESMA stressed the importance of the seminar in the context of strengthening strategic partnerships between authorities concerned to develop the halal industry locally, regionally through specifications and standards, as well as certification. “Emirates Authority for Standardisation and Metrology strives to evolve the necessary standards and specifications for the local halal industry to be a global leader in halal products and services. Our accomplishments in this area are part of our efforts to realise the vision of the UAE leadership to make the country one of the best in the world by 2021 in terms of applying the highest standards of quality in terms of consumer health and safety,” Al Maeeni said. Engineer Yousef Al Marzouqi, Head of International Conformity at ESMA, briefed the audience on ‘Halal national standards and market, following which Alia Khan, Chairwoman, Islamic Fashion Design Council (‘Islamic lifestyle market’), and Hussein Doughan, Global Director, Euromonitor International (‘Trends for the global marker for halal in F&B’) also spoke on the scope of halal products and services in different industry sectors. Dubai Exports, in association with Euromonitor International and Islamic Fashion Design Council, also launched a sector report on Islamic Fashion at the event.